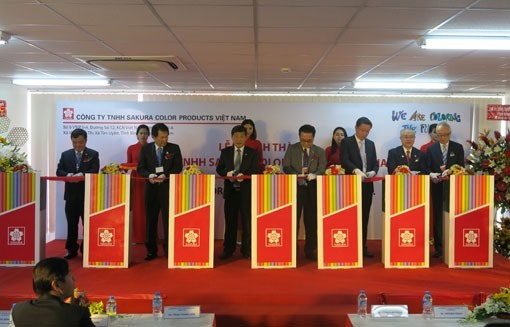 HÀ NỘI — Sakura Color Products of Vietnam Company Ltd, under Japan’s Sakura Group, on Wednesday inaugurated a factory producing crayons, watercolours and pens in the Việt Nam - Singapore Industrial Park II in the southern province of Bình Dương. The factory is located on an area of 1.5 ha and has investment capital of 800 million yen (US$7.14 million). The company expects to earn revenue of 100 million yen in 2018. The first batch of crayons, watercolours and pens produced will be exported to Japan and other countries in the region in February 2018. Revenue is expected to reach 700 million yen by 2021. Director of Sakura Company, Yamashita Takanori, said that Việt Nam was a country with stable social conditions that was favourable for economic investment. After joining the WTO, Việt Nam’s trade had been promoted and developed in addition to many economic agreements which were signed between Việt Nam and Japan. This is a good time for Japanese businesses to invest in and operate in the country. However, according to Yamashita Takanori, Việt Nam needs to focus on improving its infrastructure. The labour force in Việt Nam is young, averaging 28 years old, hard-working and skilled but the rate of people quitting jobs in localities is quite high. Speaking at the inauguration ceremony, Chairman of Bình Dương People’s Committee Trần Thanh Liêm said he expected Sakura Company to introduce the local investment environment to other investors, especially Japanese businesses, so that they will invest in the province.